Our recipe for December is an indulgent blend of all things Christmas: deep red luscious blooms, pine cone sprays, and wild berries. The aim is to evoke a crisp wander through the woods on Christmas morning, so this arrangement has been left totally unstructured, as if you’d gathered these by hand and simply placed in a vase. 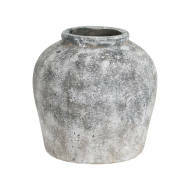 This is a forward facing arrangement for placing on a sideboard, or mantle. 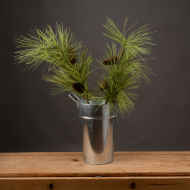 Begin by arranging the pine branches to the left, right and centre back. 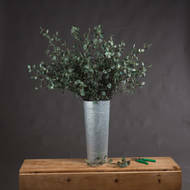 Then between these add the eucalyptus stems, taller at the back and cut down at the front. 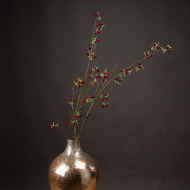 Once the greenery is in place, you can then position your berry stems at various angles. 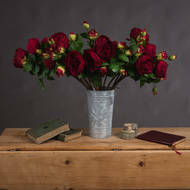 Place shortened stem roses and ranunculus in the centre front with long stems spraying out to the side. 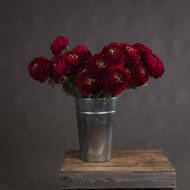 This is a very loose arrangement so you have lots of room for flexibility in how you position your flowers. Alternatively there are enough flowers here to create a table centrepiece and arrange to suit.